A puppy with a flower may be cute, but it also presents a serious canine health hazard. Flowers may be a beautiful addition to your garden, but they can make your dog extremely sick. Even the smallest bite of some flowers is enough to require a vet visit, so keep your dog out of your flowers to keep her, and your garden, healthy and safe. Erect an exercise pen across the yard from your flowers. Turn the dog loose in the pen instead of letting her roam your yard. This keeps your dog away from the flowers while still giving her plenty of room to potty and play. Install a tie-out system in your yard. Tie-outs are long cables that allow the dog to run back and forth while keeping her away from your garden. Pick a tie-out that is sturdy enough for your dog, and observe her carefully while she is tied to prevent accidents. Spray your flowers with a pet deterrent spray. Most of these training aids are made with natural, biodegradable ingredients that won’t harm your flowers, but leave behind a nasty taste. The dog will associate the flower with the bad taste and steer clear of your garden. Install motion-activated sprinklers near your flowers. These special sprinklers will squirt the dog with a quick blast of water when she walks through your flowers. The water won’t hurt her, but it will frighten her out of the flower bed. Plant a row of thorny bushes along the edge of your garden to chase off pesky dogs. Roses have both thorns and flowers, making them an ideal choice for any garden. The dog will get a small prick when she takes a bite, and she will soon learn not to eat your flowers. Spend time playing with your dog instead of just letting her roam your yard. 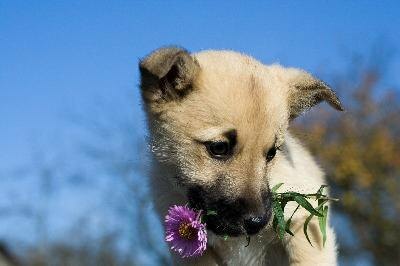 Dogs often eat inappropriate things out of boredom, and giving your dog plenty of exercise will distract her from eating your flowers. Never apply chemical pesticides to your garden. Not only will they kill your flowers, they could cause a life-threatening illness in your dog. Does Oatmeal Help Your Dog's Coat?